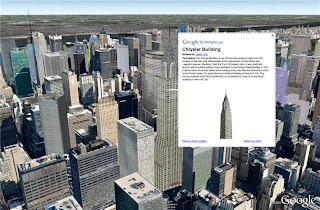 Late last week we updated the 3D Buildings layer in Google Earth. The emphasis of this release was user-contributed data; photo-textured 3D models created using Google SketchUp and published to the Google 3D Warehouse. This release was significantly larger than previous releases. Thousands of user-generated models were pushed live and we hope yours was included! The reason for the increase is that we've been working hard to identify and review 3D building models that may have been overlooked. Many thanks to our loyal modelers who have helped to identify these deserving models, and been patient while we work out some kinks in the process. If you're a geo-modeler and have been waiting for your model to be reviewed, have a look to see if it made it in this release. If not, then stay-tuned. We've already started the process of re-reviewing each and every "Google Earth ready" model submitted to the Google 3D Warehouse. It's no small undertaking but we're committed to having this completed very soon. In the meantime, hats-off to the many modelers whose models were included. To highlight a couple....check out the Chrysler building in New York modeled by Kevin Girard, or Saint Peter's Basilica and Square in Vatican City by Antonino Grasso Cristaudo. Awesome work guys! This is… incredible! Wow, I never thought anybody could do that! Does it actually look like that when you stand there for real, or does the effect only appear in photos? Because, wouldn’t it look all flat in real life? 3D models in polish cities are avaiting review for *long months*. It doesn't make sense to enable such feature if nobody reviews them. This model was reviewed on 12/10/08. 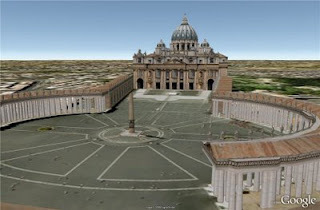 Feedback for models submitted as "Google Earth-ready" is located at the bottom of the page. You must be logged-in to see this. This particular model was not approved because it was not photo-textured. Hi Google, model was resubmitted in few days later, white walls were painted grey (they are white in reality!) and it's awaiting second review since then!